Hi All, I’m Sarah from the UK. Really happy to be part of this group. I LOVE riding but for the last 20 years, always rode a mountain bike. Rides of 40-60 miles or more were never a problem. I recently bought a new Specialized Women’s Tarmac Disc Expert and have loved it. In my 20s I used to ride road bikes so I am used to riding low in an aggressive position and do this wherever possible. However, after the third 20-mile or so ride on my new road bike, I suddenly developed very sore areas on my front ‘private parts’ (labia) - like boxers’ cauliflower ears. Very tender to the touch and swollen. As though the hair follicles were blocked, swollen and inflamed. 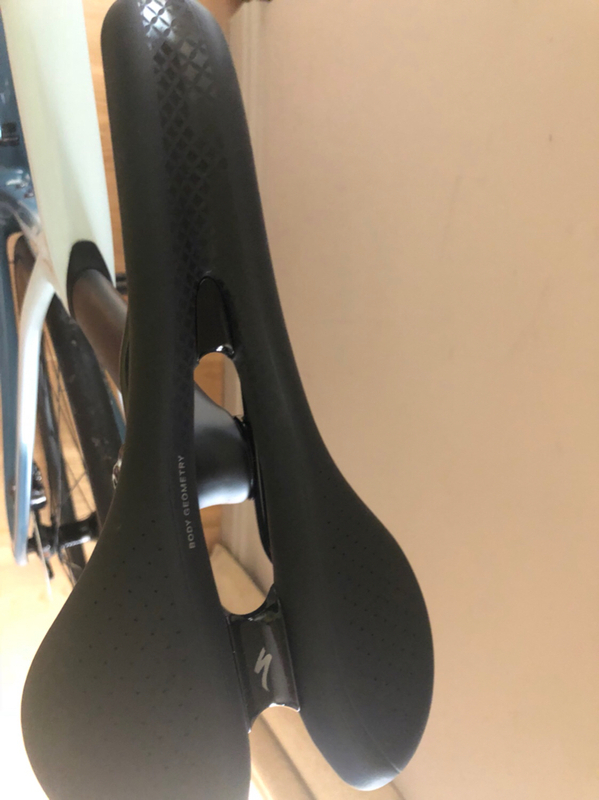 I have found some creams to use, however I think my first course of action is to reduce the seat height of my saddle (it was fitted by the Specialized store but when I ride, I have to stretch my legs a lot and end up slightly rocking from side to side). If that doesn’t work, I’m wondering what saddle to change to. I enclose a picture of my current saddle. But am thinking of changing to a ISM PN1.1 saddle which is wider at the front with a deep cut-out. What do you think? My problems are all at the front-ish part of my anatomy, due to my new road bike riding position. I look forward to your comments. Thanks a lot. Read this and measure your sitbones. Typically, chafing caused by the neck of the saddle results in the area between thigh and buttock being chafed. I think perhaps the cutout edges caused problems. IF that is a 168 or 155 mm saddle, you could try whichever size is smaller. Noseless saddles cause their own problems. And if it is a 155, I'm interested in buying it from you. Make sure you measure the outside distance of your sits, as well as center to center and inside to inside. Then measure on the same places on the saddle. Good way to troubleshoot. Edit: looks like it is a 155 mm. They also make a 143. I'd try that before going to something so completely different. The width of the neck may be moving the cutout directly into soft tissue. Is this your bike? Nice! Thanks for your help. Yes, it is an Oura Saddle. I have looked in the manual (it’s useless!) 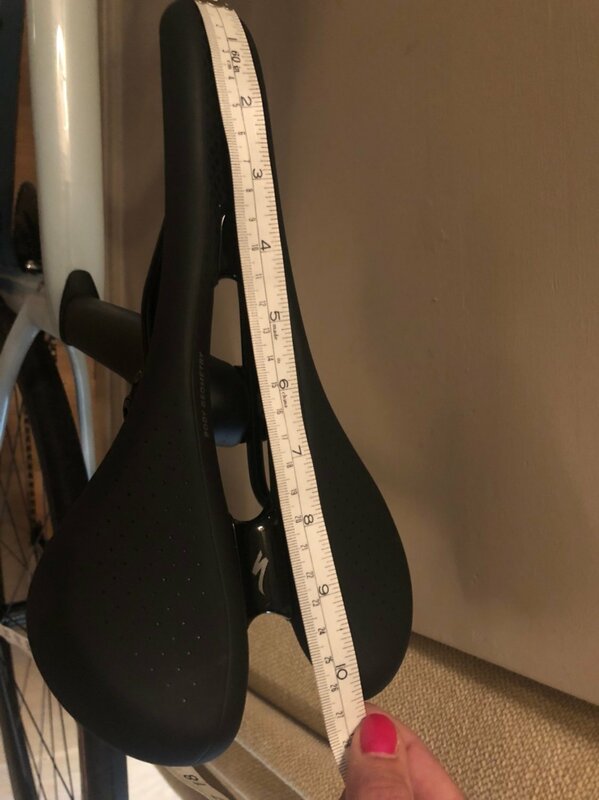 so I can’t find the actual spec of my current fitted saddle. I enclose some photos, including a tape measure, so perhaps, if you have time, you could tell me what size I’ve got? Thanks very much. Thanks Muirenn, you’re a star! I really appreciate your help on this. As I said, I will try lowering the saddle first by a centimetre or so and see if that helps first. My next step would be to take accurate sitbone measurements, as you described in the very useful article you attached. I LOVE my new bike - it’s already made me faster than on my S-Works Stumpjumper but the pain and swelling are like nothing I have experienced! Hi and welcome to the forum. Nice to have you with us. Yes, if you have to rock your hips/legs side to side, your saddle height is definitely too high. Could be a cause of your problem, but, for sure, will definitely be a source of other problems, too. For instance, too high and you will not be getting max power with your pedaling. I like my saddle height to be where I can just touch the ground with the balls of both of my feet when at a stop. For my MTB riding, I sometimes drop just a touch lower, even. This really is a critical measurement, enough so that even changing shoes can affect it. Be sure to check the tilt angle on your saddle, too. I spend a lot of time on this one, but it';s worth it. Too much tilt down in front will cause your skin to stretch in the sensitive areas and you won't get enough leverage off the seat to work your legs at the best. Too much tilt back will cause too much contact with the sensitive areas, especially when the road is a bit rough and bumpy. Again, really does have to be just right. Seat adjustments are one reason why I always carry a bike wrench. Once thing that might be worth a try is using one a saddle from your MTB if still have one. No law says you absolutely must use a road saddle, but, again, I think how it's adjusted is the important thing. As for width, Sheila is so right about getting that one right. Just remember, though, too narrow is also going to cause a lot of issues. 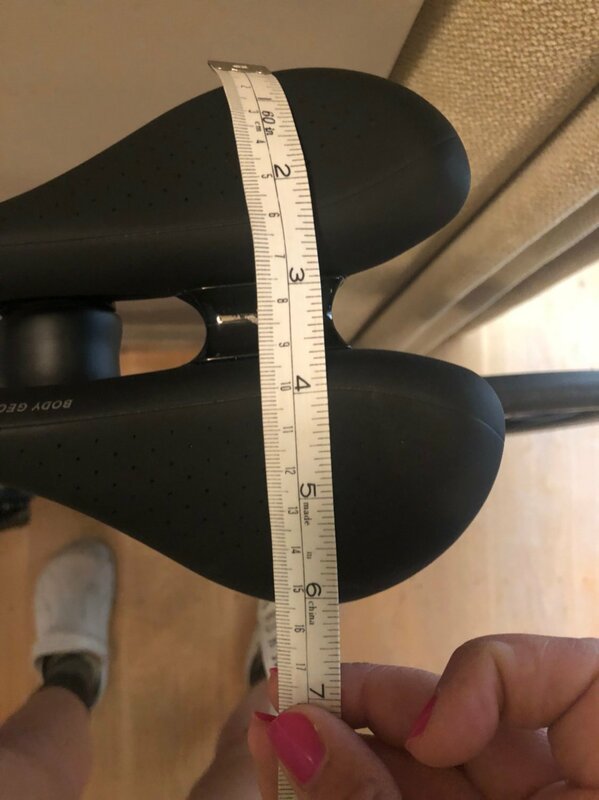 I have a wide sit bone measurement, so narrow guy size saddles have always been a nightmare for me. Usually the first thing to go when I buy a unisex bike. Thanks for your in-depth and friendly message. I really am grateful to find this group and hope we keep it just as lively and helpful always. I will do what you say - your advice is fantastic in all respects - so, thank you very much. I have lowered the saddle height by a cm and will see where that takes me. I know I can ride 60 miles+ on my MTB but can’t say the same for the road bike at the moment! I am hoping that these small adjustments and then taking precise measurements will help solve this problem. I am getting ride withdrawal and Strava absence withdrawal while waiting to heal these delicate areas! Thanks again. Best of luck, Sarah. Believe me, I know what bike withdrawal is like. Not fun. Keep us posted and keep joining in. Love having you with us. Cheers, North Woods Gal. I am loving the solidarity in this group. Thanks for all your help. I can't add anything different, except that I cannot overestimate how important the tilt of the saddle is, even in increments of 1 cm. I need mine to be slightly tilted up. I switched from a Terry Falcon to an Oura about 4 years ago. I was very suspicious, but when I was being fitted for a new bike, the shop owner recommended the Oura, as I had dealt with constant pain in the soft tissue and burning, since I started riding, despite having a cutout. Although my sit bones hurt for a couple of weeks in the transition to the Oura, I learned how to use my core strength to sit back and the pressure was totally alleviated. I now have an Oura on all 3 of my bikes, including a hybrid, where I am upright. But, as Murienn said, if it was too wide for me, it would be really horrible. Thanks. That’s very useful. I used my MTB today and measured a 20-mile ride on Strava - two QOMs and three placements in the top 5 all-time women. And I measured my seat and found that it is 2cm lower than my Specialized Road Bike. I have since lowered the Oura saddle on my road bike but have not yet dared to use it! Well, the geometry on a mountain bike is really different than a road bike, but that's a hint you might need to lower it. Did you get a real fitting from a bike shop? Not just a cursory measurement and test ride in the parking lot? They should be helping you with this. Many shops have a test a saddle program, where they have loaners to test. That's great news, Good for you. Yeah, sometimes it as easy as a saddle adjustment.